English rhubarb is a lovely vegetable - yes rhubarb is a vegetable even though more often though of as a fruit. There is the hardy, thick-stemmed, slightly tart outdoor variety. But, I am talking about forced rhubarb (rhubarb grown in dark Forcing Sheds) here. These delicate, slender stems of early rhubarb appearing in the shops are always cause for celebration. The arrival of rhubarb heralds the waning of the cold winter months and the promise of spring just around the corner. How cheering the vibrant pink colour of rhubarb is on a grey day and how delicious too. Where is Forced Rhubarb From in England? By far, most of the rhubarb in England comes from Yorkshire in the north of England. Yorkshire is fortunate to have access to some of the best rhubarb in what is known as the Rhubarb Triangle of Wakefield, Leeds and Bradford. A European Union scheme to register and protect cultural foods from around Europe has recognised the produce of the world-famous Yorkshire Rhubarb Triangle as a unique regional food. This move will protect the Yorkshire Rhubarb brand across the EU from cheap imitations, great news for growers and consumers of rhubarb. Rhubarb originated in China and Tibet. Records date to 2700BC showing rhubarb used mainly for medicinal purposes. The earliest record of the culinary use of rhubarb in Europe dates from 1608. “Forcing” rhubarb (growing it in dark conditions) only began in the early nineteenth century. This method produces a more succulent and delicate stalk of rhubarb than those grown outdoors in the garden. The telling sign of fresh rhubarb is not only its bright color; the rhubarb stalks should be firm and upright, the leaves a pale yellow and never black. As with all local, seasonal foods, rhubarb is best eaten fresh. Also, avoid storing rhubarb for too long. 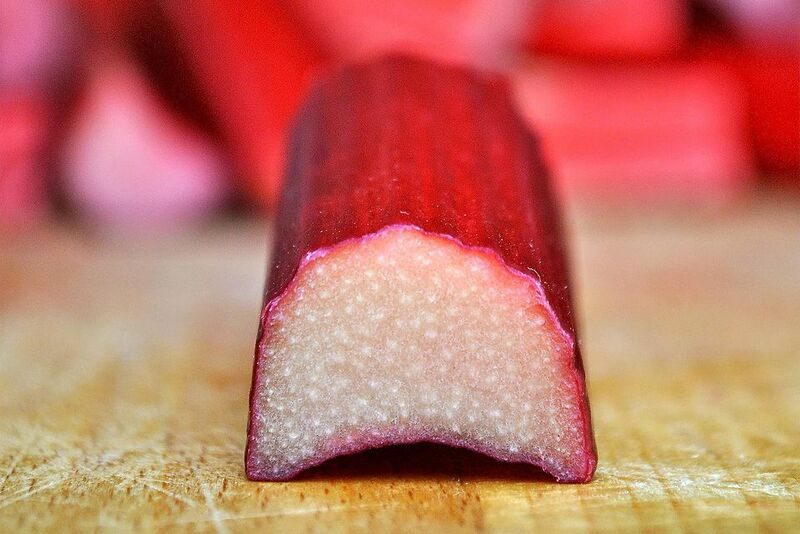 If it’s not possible to eat the rhubarb straight away, only top and tail the stalks, cut the rhubarb stalks into small pieces and poach gently, three or four minutes, in a little sugared water. Cool and freeze. This simple rhubarb compote can be used in pies and crumbles, folded into the custard and whipped cream or in many other recipes. Some of the best recipes for rhubarb are “nursery-food”; rhubarb pies, puddings, crumbles, and of course, with custard. However, in recent years rhubarb has enjoyed a lofty status appearing on menus at top restaurants alongside game, lamb and beef and one menu, even with mackerel. The stalks of rhubarb though tart are edible, the leaves, however, are toxic.